ROXY is all about empowering women. 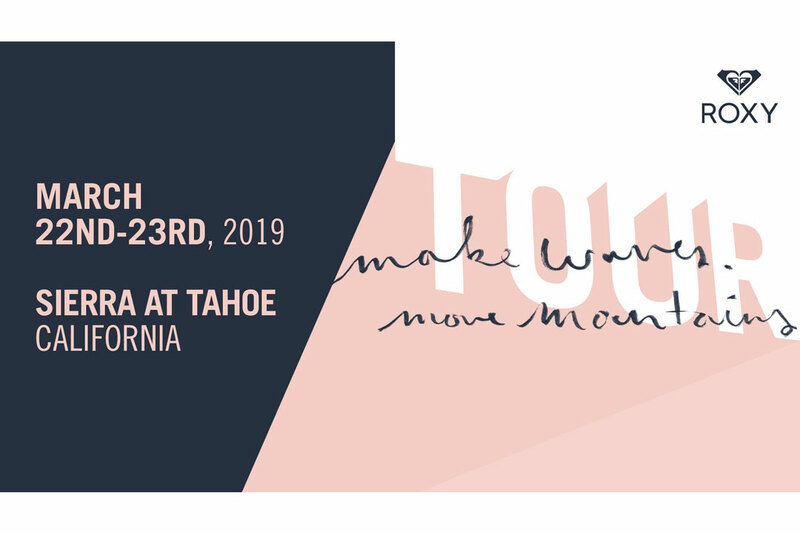 Join us at Sierra-At-Tahoe Saturday March 23, for Make Waves Move Mountains. Both skiers and snowboarders welcome to this Roxy ride + hangout day! entrance to the ROXY Hangout panelist series (remember to RSVP separately). The first 50 girls to sign up will be entered to win a ROXY snowboard and a $500 ROXY gift card! Swoop your spot today! * Lift tickets are not included in price. Lift tickets will be available for purchase at a special discounted price upon check-in the morning of the event. To wrap up our incredible day on the mountain, join us for ROXY Hangouts, an evening of sipping and snacking, socializing and a curated photo exhibit featuring photography by Erin Hogue . ROXY has hand-picked an amazing panel of women to share their stories in an hour-long Q&A session.This event is free with RSVP but we recommend that you arrive early to guarantee your spot as we expect to hit capacity. Space is limited, and admission with a reservation will be offered on a first-come-first-served basis. Torah Bright – ROXY athlete & ambassador, soul shredder, optimist and Olympic Medalist. Erin Hogue – Accomplished photographer, writer, creative director, artist, speaker and adventure seeker. Megan Pischke – B4BC Marketing and Wellness Manager, wellness activist, former pro-snowboarder and pioneer of the sport, producer, breast cancer survivor, mother and wife. 7:00 pm – 8:00 pm: Make Waves, Move Mountains Panel - The women breaking barriers and finding success. For more info and to reserve tickets, click HERE .